MONDAY, APRIL 1 The Little Gym at Falls Church; 1-2pm. Free class for ages 3-12! Limited to first 20 to RSVP at tlgfallschurchva@thelittlegym.comwith subject line “Falls Church City Schools event”. TUESDAY, APRIL 2 Jumping Joeys; 4-7pm. Discount to FCCPS families Come visit 402 West Broad St. #200. Mention Screen Free Week for the discount. WEDNESDAY APRIL 3 LEGO/game night @ MRSL; 4-8pm. Mary Riley Styles Library is hosting Lego/Game Night at the Library. THURSDAY APRIL 4 Gardening at TJ; 6pm. Thomas Jefferson’s Student Council Association will partner with us to clean up and replant the raised gardens beds. THURSDAY& FRIDAY, APRIL 4 & 5 Kiln & Kustard; 4-7pm. Fee waived for a pottery piece (small dish), materials and instruction! Visit 455 S Maple Ave. and mention screen free week to receive this offer. SATURDAY APRIL 6 Lorenzo the Great @ MRSL; 10:30 am. Come see a performance at the library. SATURDAY, APRIL 6; Stemtree in Falls Church; 2-3pm. Discounted price for a STEM class. Attend this fun class for $20. 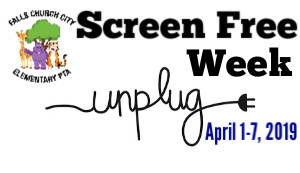 Ages 3-12 and limited to first 15 to RSVP at email fallschurch@stemtree.com with “FCCPS Screen Free Week” in subject. SUNDAY, APRIL 7; Tom Dolan Swim School Falls Church; 3:30-5:30pm. Free family swim; parents and caregivers must accompany kids in the water. Address is 6112 Arlington Blvd, Falls Church, contact 571-933-8944 for any questions.